I’m so excited… The third episode of The Rainbow Pals is finally here! As you know, The Rainbow Pals are seven animal friends that live in the South Pacific. We spend most of our time in Hawaii, but we love to travel! That’s why I tell you about Ukulele Festivals Around the World, Pearl-diving in the Cook Islands, Papua New Guinea’s Rabual and all the tropical adventures that I bring to you in my blog. In Episode 3: The Perfect Wave, The Rainbow Pals travel to the Telo Islands — a group of about 50 islands in Northern Sumatra, Indonesia. Do you know where that is? Lots of people don’t! Well, it’s north of Australia. And the thing the Telo Islands are known for best is surfing! 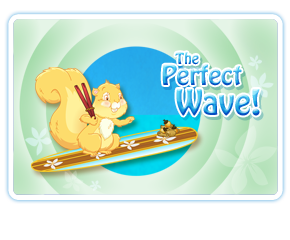 So when my friend Kokio told me he was looking for a good place to surf, I knew where we should go… Find out what happens in The Perfect Wave! The South Pacific is such a unique place. All you need to enjoy it is a sense of adventure and a willingness to try new things! And that’s what The Rainbow Pals are all about. Friendship, cooperation, learning and — above all, F-U-N, fun! I hope you enjoy our new webisode. Also, don’t forget to drop by The Great Ukulele Video Contest. We’ve received our first entry into the contest, and it’s a lovely ukulele song that I know you’ll enjoy! psssst! Are you following me on Twitter yet?